Manufacturers of marine coatings and other corrosion-fighting systems continue to improve their products and services, with emphasis on reducing costs, both of the products and their application, and by extending drydocking times. The editors of MR/EN asked the following major suppliers of marine coatings and other corrosion-control products and services to tell us about their latest and most important products and capabilities. The review that follows is based upon the replies received at press time. FOR MORE INFORMATION If you wish to receive additional information on any of the products and services described in this article, circle the appropriate reader service number(s) on one of the postage- paid cards near the back of this issue. AMERON MARINE Circle 57 on Reader Service Card Within the last year, Ameron Marine Coatings Division, Ameron, Inc.
of Monterey Park, Calif., has introduced a new high-solids, high-build urethane coating for marine and offshore applications. Called Amershield ™, it is a multifunctional product offering many important features, including long-term color and high gloss retention, outstanding resistance to abrasion and flexing, plus excellent resistance to direct and reverse impact. It also provides good resistance to chemicals and staining. Amershield provides an excellent barrier coating and can be applied without a primer to clean, blasted, galvanized or phosphated steel, and to many other substrates including aluminum. It can also be used as a refresher coat over intact, old paint, or as a finisher coat over a high-performance anticorrosion system such as Amerlock® 400, Ameron's highsolids, high-build epoxy coating. Many areas of marine structural steelwork can benefit from the versatile, durable protection offered by Amershield, including offshore platforms, barges and the superstructures, decks, topsides and boottops of ships. It is also an ideal coating for dry cargo holds, and the combined Amerlock/Amershield system has recently been awarded the North of England Industrial Health Service's Certificate of Approval for the carriage of grain cargoes. Amershield can be applied simply and easily using standard conventional, airless and electrostatic spray equipment or, because of the product's good flow characteristics, by brush or roller. Amershield is also an environmentally acceptable product, more than meeting the U.S.'s stringent EPA VOC requirements. CHESTERTON Circle 10 on Reader Service Card Chesterton High Temperature Metal Repair System, consisting of three products formulated for the toughest marine environments, particularly high heat, extreme corrosion and wear, has been introduced by Chesterton's Technical Products Division. The three products—#910 High Temperature Steel Putty, #952 High Temperature Super Abrasion- Resistant Putty and #958 High Temperature Abrasion Control Putty— are in two components. They can be applied to surfaces or new equipment to protect against damage, exposure to erosion, corrosion and abrasion, or to rebuild and protect damaged equipment. To be effective, all three must be heat-cured before being placed in service. External heaters are sufficient, as well as the heat generated by the equipment to which it is to be applied. Unlike conventional twocomponent products, the properties of these products will not improve in time without the application of heat. Once the heat cure cycle is completed, full physical and chemical properties are restored. Equipment can immediately be put back into service without awaiting maximum properties. Equipment can be operated continuously in temperatures up to 450 degrees F after heat curing, and the products will retain more than 75 percent of their original hardness. Subsequently, hardness will be restored fully, to 100 percent of the original. Chesterton's #910 High Temperature Steel Putty is a metal-filled product designed for applications in which corrosion resistance is more important than resistance to erosion impact or abrasion. Its chemical resistance is high, and it will not rust or corrode. #910 is readily machinable, and can be applied in a smooth finish. It stays in place during application to vertical surfaces with minimal sag. The company's #952 High Temperature Super Abrasion-Resistant Putty is a rough textured product with a high concentration of ceramic beads. It is not machinable because of its highly abrasion-resistant properties. Chemical resistance of the product is high. Chesterton's #958 High Temperature Abrasion Control Putty produces a smooth wear-resistant finish. It is especially useful in fluid flow applications, in which a smooth finish is essential to minimize cavitation and enhance efficiency. The product is effective in protecting against erosion, corrosion and chemicals. Chesterton's #958 can be machined, but diamond-tipped tools are recommended. DEVOE MARINE Circle 11 on Reader Service Card Devoe Marine Coatings Co., a division of Grow Group, Inc., continues to offer unique, high technology solutions to the fouling and corrosion problems of the marine industry. Devoe Marine developed ABC® #3 Tin-Free Ablative Antifouling which provides the shipowner the long life antifouling properties, reduced drag resistance, hull smoothing, fuel and maintenance savings previously associated with the TBT self-polishing copolymers without utilizing TBT. ABC #3 has been applied to over 200 vessels covering millions of square feet of underwater hulls in applications ranging from tugs to tankers and aircraft carriers to nuclear submarines. The company reports that nearly five years in-service experience with ABC® #3 Tin-Free Ablative Antifouling has established performance which equals or exceeds that of the TBT copolymers. Of ever-mounting significance is the owner's requirement to protect substrates economically without downtime and costs associated with abrasive blasting. Bar-Rust™ 235, a New Technology Epoxy, is specifically designed to meet this need and is intended for application over tight rust. Required surface preparation is Swedish Standard D St 2 for non-immersion service and D St 3 for immersion service. Bar-Rust™ 235 is capable of being applied and will cure at temperatures below freezing. The cured paint film provides a permanent, hard epoxy lining with outstanding seawater resistance. Bar-Rust™ 235 was designed for use in nearly every possible marine application where abrasive blasting is impossible, impractical or too costly—ballast tanks, voids, potable water tanks, dry food spaces, cargo holds, bilges and vessel exterior areas both above and below the waterline. Bar-Rust™ 235 is a product with a proven track record which has successfully protected over sixty million square feet of marine vessels. In 1984, Rensselaer Polytechnic Institute, under the sponsorship of the U.S. Maritime Administration, evaluated rust compatible coatings for marine applications. Results of the tests showed Bar-Rust™ 235 to be superior to all of the coatings tested. Noxious fumes and flammable solvents can pose hazards when painting interior spaces in either maintenance or new construction situations. Furthermore, many governmental agencies are exhibiting increased concern regarding solvent emissions and are requiring VOC (Volatile Organic Compound) compliant coatings. In answer to these problems, Devoe developed its Devflex product line of fire-retardant, water-based enamels. Devran® 258 and Devran® 259, a water-based epoxy system which can be utilized on the vessel exterior or in certain tank applications also addresses safety and environmental concerns. Additionally, a line of 100% solids products are available. Aged recoatability of coatings has been a long-standing problem in the marine industry. In many instances, a vessel owner must sand sweep the existing coating in order to recoat the vessel during drydock periods. Devoe Marine developed a waterbased cleaner, Devprep #88, which may eliminate the need for grit sweeping, solvent wiping or sanding an existing, intact painted surface prior to recoating. In many applications, all that is necessary to properly prepare the aged surface is to apply Devprep #88 followed by a high pressure water wash and application of the top coat. It is biodegradable and contains no phosphates, halogens, solvents or distillates. DREW CHEMICAL Circle 12 on Reader Service Card Drew Chemical Corporation, Boonton, N.J., manufactures Magnakote ™ rust-preventive compound for ballast tank protection intended to economically and effectively control corrosion of ballast tanks. Magnakote can be described as an inorganic- organic complex that forms a platelet, crystalline structure similar to fish scale. These platelets, being polar in nature, function by being attracted to the metal to form a thin but a dense and tightly adhering coating that provides an effective barrier to corrosion by maintaining an extremely low rate of vapor transmission. The active corrosion-preventive materials in Magnakote™ rust preventive compound are carried in a matrix that includes a "gelling" oil, making the final coating even more effective. Because there are no solvents to evaporate, the coating is 100 percent active. It is thermally stable, has no offensive odors, has low toxicity, and has a high flash point for safety in application. It is not required that Magnakote be completely removed to make mechanical repairs; only the area where the work is to be done will require local cleaning. Drew Chemical also markets Protecsol ™-100 seawater corrosion inhibitor, a liquid blend of organic and inorganic corrosion inhibitors specifically developed for the protection of ballast tanks filled during lay-up with seawater. It forms a passivating film on ballast tank surfaces that protects the steel from corrosion. This film remains even corrosion. This film remains even when the ballast is discharged. The rust-retarding qualities of Protecsol-100 have been found to be outstanding when based on tests by a leading independent laboratory specializing in marine corrosion studies. Exposure of steel to a Protecsol- 100 solution provides protection that remains even after the inhibited solution is replaced by uninhibited water. The solution contains no chromates, nitrites, or organo- nitrogen compounds. ELECTROCATALYTIC Circle 15 on Reader Service Card Chloropac™ and Capac™ systems manufactured by Electrocatalytic are recognized leaders in marine applications. Both products are offered in a complete range of capacities to meet the needs of commercial and military use. After sales needs are fulfilled by worldwide, factory stocked service centers, manufacturing licensees and service representatives. Chloropac installations control the complete range of marine growth—from bacteria and slime to barnacles and mussels. Marine operators select Chloropac to eliminate downtime for cleaning and improve heat transfer. Now studies show that eliminating bacteria reduces corrosion—a further benefit in both reduced maintenance and extended service life. Capac has introduced a new corrosion control anode for high pressure or deep submergence (DS). Utilizing proven military concepts, this DS design incorporates wrought platinum clad on a niobium substrate. The anode is mounted either flush or recessed into the structure. Once the gland is welded in place the anode can be replaced while the structure is submerged. DS anodes were initially installed on offshore oil production platforms. The diver serviceable (DS) feature of the anode is highly preferred when damage to the anode is likely. Therefore, icebreakers now utilize the DS design as well. Other ship and rig operators have specified DS for their applications, since the diver serviceable feature assures 100% cathodic protection capacity without delay and cost of drydocking. Electrocatalytic is a world leader in providing equipment and service, to the marine field, which protect the user's investment and offers cost saving alternatives to historical technology. HEMPEL'S Circle 54 on Reader Service Card Hempel's Marine Paints Ltd. recently introduced Uniprimer 1385, a one-coat primer which can be used on all areas of a ship above the waterline. Uniprimer 1385 is the latest product to be added to Hempel's "Maintenance- Made-Easy" program. The other two products currently in the program are Hempel's "two twoprimer and finish in one coat—and Hempel's Multi-Mil system which combats pitting in cargo tankers. Hempel's Uniprimer 1385 provides excellent corrosion protection on hand-prepared surfaces, dries rapidly and provides a sound fabrication for a wide range of top coats. According to the company, Uniprimer reduces costs to a shipowner because it is the only onboard primer an owner may need for any area of a ship except below waterline, thus making it unnecessary to stock different primers. Also, the risk of mixing incompatible paint systems is eliminated. Hempel's "Maintenance-Made- Easy" program is being backed by new "tailor-making" maintenance posters and manuals, designed for each individual ship. Through computerization, tailormade manuals and posters can be produced for each individual ship type, including variations depending on the main engine type the ship is equipped with. For each area of the ship (14 areas) the individual maintenance specification to be used is given in these manuals and posters. In addition, the manuals give individual user instructions for each paint system. Tailor-making of this sophistication has been made possible through the development of a special computer program. Within minutes, Hempel's office can prepare an individual poster and manual for an individual ship as the program includes all conceivable combinations of Hempel's maintenance systems. The "Maintenance-Made-Easy" program and the introduction of computerized maintenance posters and manuals are all part of the Hempel's Service Concept, first introduced in May of last year. In addition to the posters and manuals, a videotape has been produced in which guidelines are given on the correct on-board applications of the paints. INTERNATIONAL PAINT Circle 51 on Reader Service Card The exceptional and predictable levels of performance achieved by Intersmooth and Interswift self-polishing copolymer antifoulings are well proven. The use of tributyltin (TBT) biocides plays a critical role in achieving this performance. International Paint expects its copolymer products to meet the proposed EPA environmental recommendations. However, in the light of existing and proposed legislation covering the use of TBT antifoulings International Paint has developed a new range of TBT free antifoulings based on controlled depletion polymer technology. This new range of antifoulings— Interclene BRA540 Series—has been used by the U.S. Navy for several years and is now available in the commercial sector. BRA540 Series antifoulings offer better performance than traditional long-life and conventional antifoulings, and the best performance next to TBT type antifoulings. Application of BRA540 Series antifoulings over existing antifoulings is possible, but is dependent on the coatings history of the vessel and the coating condition at drydocking. Red and black versions of this antifouling are currently available. JOTUN VALSPAR Circle 14 on Reader Service Card Jotun Valspar is the Marine Division of the Valspar Corporation, which is one of the largest manufacturers of coatings in the U.S. Within the past two years, Valspar has acquired Mobil's North American Coatings Division, Farboil Marine Coatings, and Jotun A/S North American Marine Coatings business. These recent acquisitions are now identified as Jotun Valspar. Navy. Sovapon Tank Coating systems are formulated epoxy tank linings, which are cured or converted by a reaction catalyst at atmospheric temperatures. Sovapon has been applied to liquid cargo tanks, and/or deep tanks on hundreds of vessels, with an outstanding record of success. Included with Jotun Valspar's line of zinc coatings are a variety of products based on various generic resin systems, as for example, organic zinc coatings, manufactured with chlorinated rubber, or epoxy resins. Inorganic zinc coatings are provided either with solvent or water using silicate resin systems. Of significant interest to the marine industry is a one-package inorganic zinc silicate coating that is used as a pre-construction ship primer. This product is applied automatically after abrasive blasting at a dry film thickness of approximately 0.75 mils, and will provide corrosion resistance without topcoating for about one year. Jotun Valspar zinc coatings have had extensive marine service, with applications on exterior hull topsides, deck and cargo tanks of vessels. A recent innovation is the introduction of Vepok, a unique group of protective coatings that can be applied over oily, wet, rusty surfaces. Jotun Valspar is a complete supplier of coatings to the marine industry, and therefore in addition to the above mentioned coatings, also manufactures and provides antifouling points and specification coatings that are used by government agencies, including the U.S.
PHILADELPHIA RESINS Circle 56 on Reader Service Card Three new materials called Super Repair Products have been formulated by Philadelphia Resins, Montgomeryville, Pa., to resist abrasion, impact, cavitation and corrosion at elevated temperatures and in adverse environments. Developed especially for high-temperature, highfriction aerospace, marine and industrial applications, these easy-touse materials include an alloy paste, a ceramic repair liquid and a ceramic repair putty. Phillybond® Super Alloy is a titanium- based compound, used to recondition compressor housings, propulsion shafting, valve bodies and other equipment which must operate in adverse environments with temperatures between —100° to 500°F. In addition to permanently repairing and protecting marine, industrial and aircraft components made from steel, aluminum, brass, carbides, zinc and zinc alloys, this new compound bonds dissimilar metals without galvanic corrosion problems. After curing for 18 hours at 72°F, it may be machined and finished with standard metalworking equipment. Phillybond® Ceramic Repair Putty and Phillybond® Ceramic Repair Liquid are specialty repair compounds, developed for coating, lining and protecting pump casings, valves and other new or worn equipment subjected to friction, corrosion/ erosion and cavitation. With convenient, long-term repairs of worn metal surfaces on-site, the brushable liquid and the nonsagging trowelable putty reduce downtime in repairing vital machinery. Their useful thermal envelope is also -100° to 500°F. No heat, pressure or special tools are needed to create an integral bond between the titanium-based, machinable repair compound (or the severe-service ceramic liquid or putty) and new or worn equipment. The company reports abrasion resistance, per ASTM D406, is five times better than competitive products. PRC Circle 22 on Reader Service Card More than one million square feet of Proreco® deck coating systems have been applied to exterior decks of small boats, large commercial ships, towboats, offshore rigs and military ships. Manufactured by Products Research & Chemical Corporation (PRC) of Glendale, Calif., the interior and exterior Proreco® coating systems are fire-retardant, resistant to acids, caustic chemicals and petroleum products. Proreco® III exterior coating systems are used to virtually eliminate costly maintenance and down-time for working ships. The PRC Proreco ® III coating systems are specified by many naval architects and specified by the military due to its known track record for corrosion control, dependability and long wear. Proven to be the most effective, the Proreco® III coating systems have an inherent flexibility to withstand normal stress caused by deck movement. The fire-retardant systems provide the ultimate in corrosion control and are resistant to the heaviest abrasion and impact. The advantages of the Proreco® III systems over rigid coatings is the Proreco ® elastomeric base which is not brittle and not subject to cracking, chipping or spralling. The Proreco® I coating system is specified for habitability areas such as heads, galleys and mess decks. Proreco® I proves itself again and again as a low-cost, minimal maintenance system for living spaces. The Proreco® I polyurethane coatings provide an attractive high gloss appearance coupled with the longwearing capability and flexibility to withstand structural movement, impact and abrasion, with extended corrosion control. The Proreco® I coating system has both U.S. Navy military specification and SOLAS approvals. 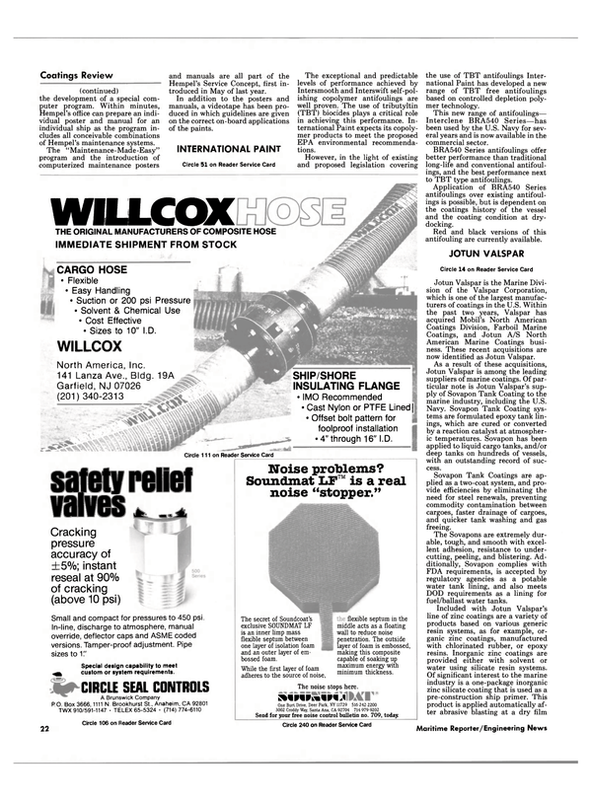 Products Research & Chemical Corporation developed the first onepart polysulfide marine caulk many years ago. Currently PRC supplies to the marine market a full line of both one-part and two-part polyuretane and polysulfide sealants and caulking compounds. WILSON WALTON Circle 23 on Reader Service Card Wilson Walton International has been one of the leaders in corrosion control technology for many years. As a result of extensive experience in the field and many years of research and development, four new innovative products have been developed and recently introduced— Aquamatic II Computerized Controller, Aquamatic Data Logger, Aquamatic Preloader and Zincolite Pit-Guard Anode. The Aquamatic II impressed current cathodic protection system incorporates what is said to be the industry's only computerized controller. Mechanical meters have been replaced by large LED digital displays. Precise circuitry allows for controller accuracy to one-thousandth of a volt, and all calibration and self-testing is automatically carried out every nine hours. Most importantly, the computer controller ensures that the hull will receive the best possible protection from corrosion. Wilson Walton has a policy of providing free analysis of recorded log readings, as this service enables ship owners and operators to maintain complete sets of analyzed data on file. Because the effectiveness of this analysis is solely contingent on the accuracy of these readings, an Aquamatic Data Logger has been developed to automatically record readings. The Data Logger will print a complete set of readings twice each day, with all operational parameters being indicated during each printout, and all recorded readings are automatically analyzed. The Aquamatic Pre-Loader was specifically designed to prevent over-protection of the hull, which can result in premature coating failure. Depending on the manufacturer, cathodic protection systems produce a leakage current of 3 to 10 percent of rated capacity. This excess current is normally permissible, except on hulls which have been painted with a sophisticated coating which has remained in excellent condition. The Pre-Loader completely eliminates this problem by automatically redirecting the leakage current back into the system, thereby lowering the operating voltage at the anodes. Wilson Walton International has also made great strides with zinc and aluminum sacrificial anode applications. The Zincoline Pit-Guard anode is specifically designed to prevent corrosive pitting on the bottom shell plating in cargo tanks. With each anode resting directly on the tank bottom, protection is provided during cargo voyages when residual water settles below the oil, as well as during saltwater ballast voyages.